The notion that we’re all just computer simulations living in a simulated universe—once the stuff of late-night college dormitory bull sessions—has now resurfaced, having been espoused by (among other eminences) a world-famous astrophysicist and an Internet entrepreneur billionaire. The notion is the latest manifestation of what was perhaps first contemplated (and then, at least to his own satisfaction, disproved) by Descartes, whose cogito, ergo sum—I think, therefore I am—was the first step in an attempt to figure out what can be reliably known, although he considered not a computer program creating the illusion of his body and his world, but an evil demon. The idea is a close cousin of the philosophers’ thought experiment (or parlor trick) known as “brain-in-a-vat,” which is said to have inspired the Matrix movies. Notice, though, that brain-in-a-vat requires a real brain in a real vat and the Matrix movies had real brains in real people plugged into their simulated world. The proposition that we’re all just computer simulations in a simulated universe eliminates the vat, the brain, the people, and the world. It can also be seen as the nerd’s version of the notion that we’re all simply dreams in the mind of God—perhaps the central creed of a Church of Computer Science. The universe contains a vast number of stars. Some of these stars have planets. Some of these planets must be like Earth. Since intelligent life arose and eventually invented computers on Earth, intelligent life must have arisen and invented computers on some of these planets. It is (or inevitably will be) possible to simulate intelligent life inhabiting a simulated reality on a computer. Since it’s possible, it must have been done. There must be a vast number of such simulations on a vast number of computers on a vast number of planets. Since there’s only one real universe but there’s a vast number of simulations, the probability that you’re living in a simulation approaches one, while the probability that you’re living in the real universe approaches zero. Having no empirical evidence or testable implications, this argument is not science or even scientific speculation. In the language of pragmatism and logical positivism, if the notion can’t possibly make any testable difference from the belief that we’re really living in a real universe, the notion is worse than wrong—it’s meaningless. It’s also remarkably anthropocentric. Although the rise of our kind of technological intelligence seems inevitable in retrospect, every step leading to Homo sapiens and our computers was both extremely rare and entirely accidental. All the crucial steps in this chain appear to have occurred only once on Earth: multicellular life, intelligent life, Homo sapiens, and computers. In particular, there’s little evidence that there’s any selection pressure toward greater intelligence, and there’s even less evidence that, except for humans, organisms with greater intelligence inevitably invent anything, including computers. And, even if another form of life on another planet developed computers, on what basis do we assume that such a project would even occur to them? Maybe they’d find a better use—such as solving the problem of the heat death of the universe. Speaking of dreams, it must be conceded that we’re not all that hard to fool—after all, we believe in the reality of our dreams as we’re dreaming them—it’s only upon awakening that we realize how insubstantial and unconvincing our dreaming reality was. But we do realize it, recognizing the richness of our experience, its persistence, its detail, its continuity, its logicality and consistency. In our thought experiment of simulated consciousnesses living in a simulated world, our imagined computer is capable of producing detail equivalent to our waking reality at unlimited speed, and would be flawlessly convincing. Having to deal with petabytes of data nearly instantaneously, this imagined computer would have to be vastly more powerful than even the most powerful supercomputer now in existence, and would have to run a program vastly more complicated (and less error-ridden) than any ever yet written—call it a superdupercomputer. But even a superdupercomputer wouldn’t produce even a single conscious being. The crucial move in the argument is that the simulation of a human mind would actually be conscious in the same sense that you and I are. Your computer simulation wouldn’t simply behave exactly like a real person, it would actually feel pain, pleasure, lust, fear, anger, love, nausea, angst, ennui, and everything else you can feel. It would actually experience the same optical (and other sensory) illusions you do. It would feel what you feel when you get sick, or when you drink or take drugs. It would fall asleep and dream, and then wake up to realize that it was only dreaming. Presumably, it would even die. The brain is an information processor. A computer can be programmed to process the same sort of information the brain processes in the same way that the brain processes information. The conscious mind arises from information processing in the brain. Therefore, a conscious mind will arise from equivalent information processing on a computer. The argument depends crucially on the concept of information, which isn’t as straightforward as it perhaps appears. In some contexts, we mean physical properties that, when we look at them, are traces of a prior (or perhaps current) state of affairs. This sort of information includes, for example, tree rings, ice cores, geological layers, fossils, forensic crime scene evidence, photographs, movies, and audio recordings. In these cases, the physical properties properly interpreted give us evidence of such things as the age of a tree or a glacier, the age of a geological formation, the presence of certain animals during certain periods of time, what happened during the commission of a crime, and so on. In other contexts, physical properties have been intentionally set, directly or indirectly, by conscious agents (on our world that presumably means people) to be a signal—that is, they are intentional representations or transmissions. For example, the words I’m writing and you’re reading here are subject to your interpretation. To someone who’s never encountered written English, these words are just meaningless marks on paper (or screen). In fact, until the signs or signals are interpreted, they can’t be said to contain information at all—only data, despite the fact that the relevant field of study has been dubbed information theory (rather than, more accurately, data transmission theory or signal theory). In some cases, the question of whether or not a piece of data is a signal is a problem. For example, in the search for extraterrestrial intelligence (SETI), it can be an open question whether a particular stream of electromagnetic radiation from a particular source actually carries any signals from an alien intelligence or is simply a natural phenomenon. The distinction between data and signals is crucial to our understanding of the brain. To simplify matters, we’ll begin with the simple reflex arc. In a reflex arc an afferent nerve responds to a stimulus (for example, a doctor’s hammer hitting your knee just below the kneecap) in a way that makes an efferent nerve discharge (causing, for example, your knee to jerk). In medical and physiological textbooks of the 19th century, the reflex arc was described in terms of discharge, conveyance, conversion, and the like. (Concepts of information, messages, signals, and so on were all available in the 19th century—but the authors of those texts didn’t liken the reflex arc to a telegraph.) In short: the reflex arc isn’t processing information. As it is for the nerves in a reflex arc, so it is for the rest of the nervous system, including the brain. Although we find the analogy or metaphor compelling, the brain isn’t actually a computer. What the neurons in the brain are doing isn’t dependent on their interpretation—although neuroscientists try to interpret the data from, for example, a particular neuron in the visual cortex. Our recordings of brain activity (for example, fMRIs) provide us data—but it’s not data being processed by the brain itself. Our neurons are not interpreting signals, they’re simply behaving as they evolved to behave. This article appeared in Skeptic magazine 21.4 (2016). There’s another irony concerning the notion that we’re all just computer simulations. If you believe you’re living in a computer simulation, then everything you think you know about the world—including its vastness, the probability of intelligent life elsewhere in the universe, and even the very existence of computers—is part of that simulation, and so is completely worthless. The evidence on which the entire chain of reasoning depends, in short, is illusory—and so nothing at all can be argued from it. Finally, if we believe we’re just simulations, how should we behave? Should we treat everyone around us as if they’re just a figment of someone else’s imagination, shamelessly manipulating them for our own pleasure or gain? Should we take careless risks, knowing we’ll live again in another simulation or after a reboot? Should we even bother to get out of bed, knowing that it is all unreal? I think not. Applying a variation on Pascal’s Wager, I’ll live my life on the assumption that I’m real—and so are you. Peter Kassan, over the course of his long career in software, was a programer, a software technical writer, a manager of technical writers and programmers, and an executive at a software products company. He’s the author or co-author of several software patents. He’s been a skeptical observer of the pursuit of artificial intelligence for some time. 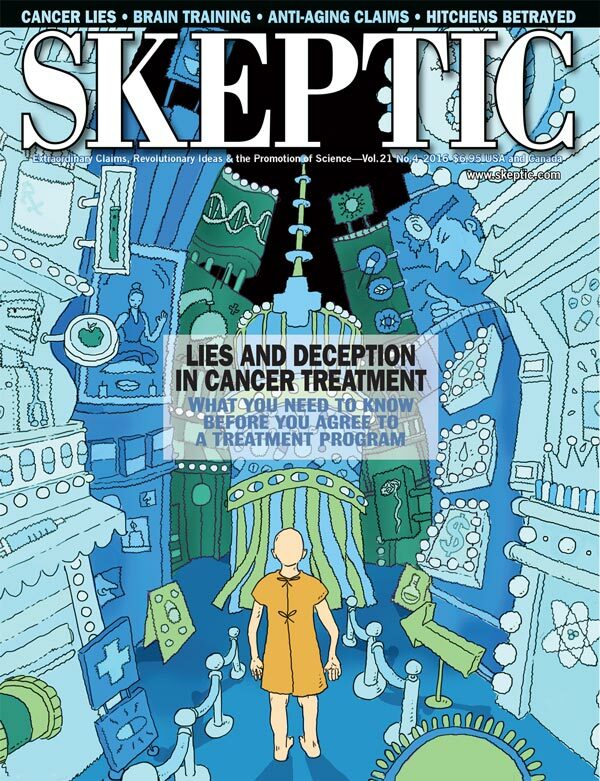 His last piece for Skeptic was “AI Gone Awry: The Futile Quest for Artificial Intelligence,” in Vol. 12, No. 2. Isn’t it rather dualistic to argue that a simulated person could not, in principle, experience consciousness? If you simulated all the atoms and molecules of a person directly, then why wouldn’t they have the same level of consciousness as a “real” person? And why do you think that only a perfect simulation could experience consciousness, that this configuration of atoms is absolutely necessary? It seems rather more likely that there are plenty of configurations which lead to entities which experience consciousness, not just our own. In the first case, the simulation must take up an enormous amount of physical matter in the host universe. And any further sub-universes must also take up matter in the top-level universe. There just isn’t enough room for the uncountably-many universes the hypothesis suggests. In the second case, we’d have to assume that the universe above us is inhabited by humans, specifically, because that’s the most realistic circumstance in which they’d make a point of simulating humanity in particular. This becomes even more anthropocentric. Plus, I’m not convinced this solves the numbers game either: to stimulate the requisite number of human worlds, the top-level universe needs a galaxy-spanning human empire that devotes most of its resources to simulation, which seems unlikely. 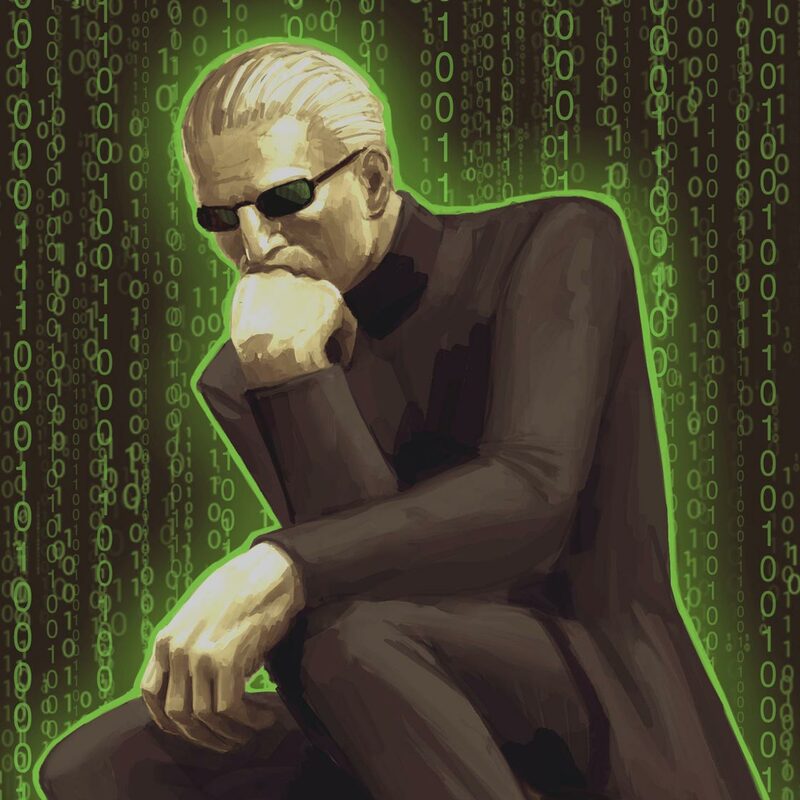 Anyway, my point is that there are good arguments against the simulation hypothesis (and good arguments that even if it’s true, it shouldn’t affect your life; these are left as an exercise to the reader), but dualism isn’t one of them. The arguments against a simulated universe are the same as against a god that made the universe. Generally, one of the best arguments against a god creator is that the universe and biological life really looks that a natural evolution. Why would a computer programmer simulate tree rings, geological strata, Galapagos animals, or awful microbial diseases? The same questions are difficult for a young earth Christian to adequately explain. At least the young earther says that her god did this to fool us so that this god can find those humans that question nothing, because this god wants those somewhat ignorant souls to live with him in the afterlife. What would be the reason for a computer programmer to simulate these natural phenomena? Our souls will not live with him in the afterlife – why would he want to fool us into believing our world is totally a natural evolution when we look at any of its details in a logical manner? Maybe there is a way to discover if we live in a simulated universe, the computer programmer slipped up, created a software bug, we look at some part of nature – and eureka – it looks like a simulation. Until then, there is no evidence. One can safely assume this place is the real thing. I believe that both the speed limit of light and the plank scale have both been argued to be, maybe not “bugs”, but indicators of the simulation’s limits. Can’t really remember more, and am too tired/lazy to Google it. But yes, the cost in computing power for a nested set of simulations becomes unrealistic for the original universe fairly quickly. Seems to me that the opening paragraph’s mention of the simulation theory being espoused by a “Internet entrepreneur billionaire” (Elon Musk) is a sort of argument by non-authority. Anyone who is genuinely interested in this topic might want to read the original paper by Nick Bostrom. Copies are easily obtainable on the Web, e.g., https://www.fat.bme.hu/student/pub/Programozas3/SimulationArgument.pdf . Bostrom is a philosopher rather than a scientist. Not that there is anything wrong with that, unless you think philosophy is a waste of time. 1. This the real thing. We are not sims. 2. This is a sim and the beings who created it are doing it for the sole purpose of playing God. This is nothing but a game for them. Same thing as Descartes evil demon. 3. This is a sim. However, there is something very special going on in the real universe. The beings who created this sim are trying to figure this out. There is a danger in playing with their real world and by doing an extremely accurate simulation they might figure out the problem. Hypothesis: Time on the real world is different from our time. Every second of our time could be millions of years in real time. So, these beings do not necessarily need fast computers just ones with huge memory. As pointed above, you would need an army of beings to support this monster. More like trillions of beings and a super massive computer. Maybe you need huge computers just to run the thing. In this scenario they might need a universe just to simulate a universe. Maybe that’s what’s needed to solve this unknown problem. Think about this: They are probably watching! That’s assuming everyone one on earth and all the material used to make up the earth (from atoms to entire galaxies) needs to be part of the simulation. Who’s to say you’re not the only person in the simulation and the only things that need to “exist” at any one time are the things that you interact with. If that’s the case, all the programming is much easier to handle, though it’s usefulness is still questionable. “So your brain was an organic part of the penultimate configuration of the computer programme,” said Ford, rather lucidly he thought. “Well,” said Arthur doubtfully. He wasn’t aware of ever having felt an organic part of anything. He had always seen this as one of his problems. “What, the question?” said Arthur. “Yes,” said Ford and Trillian. “What?” cried Arthur, backing away still further. “See what I mean?” said Zaphod and howled with pain because of something that Trillian did at that moment. Using a variation of the Ship of Theseus argument, simulated minds seem far from impossible. Take a living, functioning brain. Do a micro-surgery and replace one biological neuron and its synapses with an artificial one that replicates all of its behaviors, but includes the ability to record and transmit its state. Now do this to a second neuron. And a third. And so on and so forth, until the whole brain and then the whole nervous system has been replaced by an artificial version. You’re now, for all intents and purposes, digital, and yet you have consciousness, emotions etc. Now take all those states all your artificial neurons have, and store them as they are at this instant. Isn’t that mass of information a backup of your consciousness at that instant? Now copy those states in another brain made to be exactly like the original, and start it. Aren’t now two of you? Now take that state and make it run in a computer simulation of that full brain. Isn’t that a simulated, bodiless version, fully conscious, able to feel emotions etc. version of you? We don’t know how compact that mass of information is. It might be impossible in practice to store, if it takes Quantum states of a gazillion particles to work. It might be almost trivially simple to store, if experiments determine that all that matters is the connectome and a few simple rules about neuron’s treatments of incoming and outgoing electro-chemical signals. If it turns out to be simple, that doesn’t mean “whole world simulation” would happen. But I fail to see what’s inherently impossible in the existence of simulated minds themselves. At the very minimum, it mighg provide for durable bodies, practical immortality, and a real prospect of interstellar travel. You seem to believe that consciousness resides in the individual neurons. What proof have you. We understand that personality and abilities are changed through damage to them, but we’ve yet to explain much less understand human consciousness. This entire issue is today’s equivalent of the old question about how many angels can dance on the head of a pin. We are only now beginning to rationalize some of the less intuitive characteristics of physical “reality.” For the present, we no longer believe in angels, at least not in the primary halls of science. Alice in Wonderland, far more believable than angels with wings to fly up to heaven. At least rabbit holes exist. It seems to me that the real debate here is not so much about simulation as it is about Design. “Simulation” brings in all the issues around information processing, AI, etc. These are all interesting subtopics, but the big question is: How do we explain our highly improbable existence in a highly improbable universe? If you had a universe-generating machine that randomly spit out universes with varying natural laws and constants, you would be extremely lucky to get one that would hold any significant amount of order for even a short period of time. To get one that lasts billions of years with the properties to generate and sustain life is just asking too much. Design is the more likely explanation. The multiverse option is the only theoretical alternative, but no evidence of a multiverse yet. Why do you believe that a designer is more probable than multiple universes? If you say a simulation can’t feel, the same argument can say atoms can’t feel. We must therefore be souls, the ghosts in the machine. Then again, what even is a machine or even an atom?… or the universe? Martin Gardner knew it as a mathematical construct–highly abstract. I hope to god that this is a simulation. I’d hate to think that Trump was real. Thinking he’s imaginary is bad enough. Ah, the guy who simply has to insert his political leanings into any subject, even one that has zero bearing on politics. So where did that intelligence come from? Well, if something has to have always existed, that would be it. Because, intelligently arguing and speaking, we, and our universe, cannot have come from nothing. I don’t believe natural selection theory requires any intelligence exist a priori to shape the evolution of intelligence in life forms. That’s why natural selection is an outdated theory. Try adaptive mutation if you’re in favor of a more logical approach. The quantum froth is constantly producing particles out of nothingness. Most are paired with their equivalent anti particle, so nothing happens. But, every now and then… BAM! You get a universe. Blather without Guinness is still blather. Guinness without blather is still Guinness. A simulation can build from scratch to be quite complex. No reason to restrict a simulation to our own limits nor constrain it to our patience. Whether this is a simulation or, what exactly it could be if not a simulation, the real question is as a self aware, conscious being, what will happen once you no longer exist, if that is possible? You can only validate your own existence, all else is…imaginary? Should you no longer exist, then you will have no way to know if all else exists. All else becomes irrelevant. If we question whether the physical universe is “physical” or not, and we consider subatomic particles, it’s pretty easy to conclude that it’s not really physical at all. It’s more like energy and matter are one – both being just energy in different configurations, with some configurations giving rise to one sort of observation, and other configurations giving rise to other sorts. I for one can’t see the benefit in concluding that the stuff is even energy. It might as well be “mere” information. This disconcerts me only marginally, since neither can I see what difference it will make to anything I perceive or otherwise experience. And the idea provides us with some additional avenues to question what we are and what “artificial” intelligence might be. Observations by physicists are coming to have greater and greater influence on philosophical topics. All to the good. Simulating the state of every subatomic particle in the universe would be a daunting task indeed, even for a superdupercomputer. If I were building the simulation, I’d only allocate space in memory for, and initialize, the variables for said particles when the information is actually required. Such as when they are being observed or measured. Before that, they could be considered to be in any or all states at once as one wishes. Quite a space saver. Huh. Kinda like Schrödinger’s cat. Or exactly like Schrödinger’s cat. Hmm. So all those really intelligent theoretical physicists aren’t just being paid for BS? Disappointing that such a low quality piece gets published at SKEPTIC, barely worth pointing out the individual logical inconsistencies and points of blatant lack of imagination by the author. Suffices to compare the contribution to Bostrom’s original piece on the topic (cf. link in comment 3.) to understand how inadequately the author here simplifies the problem. To name only 3 of many issues: Does the author really not understand that simulating his brain neuron by neuron, we would inevitably get a similar personality like his, claiming to have conscious feelings (and ironically itself as simulation claiming that a simulation couldn’t feel how it ‘feels’!)? Or, does the author really think that what currently (and for us humans in our real or simulated universe!) is a superdupercomputer will always (and everywhere..) remain the state of the art/imaginable? And, the author shows that he does not even understand that the speed of the simulation is entirely irrelevant for what can be simulated if time permits. The statement “Since there is one universe but many simulations the odds (sic) we are in a simulation approaches 1” is mathematically unsound, for two reasons .(1). If there are many real simulators and many more simulations, the probability that a randomly selected planet is a simulated one may be greater than 1/2 but need not be close to 1. (2). The probability of Earth being a simulation is either 1 or 0. If there are 1,000,000 lottery tickets and 1 winner, the probability of a randomly selected ticket being the winner is small, but after the draw, every ticket’s chance of being the winner is either 0 or 1. Not “approaching 1 (or 0)”. The Radical Constructivist’s (von Glaserfeld) view point is probably a more interesting viewpoint to have. Similar to Maturana’s Biology of Cognition and von Foerster’s Second Order Cybernetics. Recursive relationships between “form and content” is at the heart of all human ideas, thought and theory. All thought, ideas and theory start with a paradox (because of this recursion) and antimony that is conveniently ignored or forgotten by its proponents. Then the knowledge idea is expanded like a spiral and in its unity of concept it dislocates from other ideas and its original seed. For example the concept for energy is purely an accounting principle (a mental construct) made of of two factors (intensive variable-content and extensive variable-form). The same with Heisenberg’s Uncertainty principle it only multiplies these two factors by time. It’s the same with Art, (form and content). Same with mathematics- mathematics is the study of “form” of any “content” with serious limitations. The same with language (syntax- form and semantics-content). The same with music (score-form and expression-content). The humorous part (of society) is everyone tries to have some explanatory principle that they have constructed for themselves to explain other declarations of other explanatory principles. At the heart of it all lie major paradoxes just like a black hole. Russell’s Liar Paradox, or Godel’s Incompleteness Theorem. Turing’s Halting problem. And the very nature and problems of “Models of Computation” we have available to us. Everything must be considered on the basis of scale. Are the stars and galaxies really a part of a much larger object or being? At the same time, are the atoms and subatomic particles the substance of a much smaller universe occupied by beings like ourselves who are trying to fathom the same things that we are? Perhaps Dr Seuss was right. So who, or what, created the computer that created the supercomputer that constructed the superduperecomputer? And why stop there? Why not a superduperBrobdingnagiancomputer? Actually, we are the latest product, perhaps transitory, of a computer whose OS is DWM (descent with modification), aka “evolution”. Living in a simulation would solve one of the puzzles of quantum psychics, that the state of particles is not known until observed. This suggests that the tiniest level of detail is not rendered until required – to save processing power. One more point… I’ve been looking for proof of the simulation, like an Easter Egg in a video game. If I find it though, that may have been the purpose of the game and the game may end. So sorry if I find it! You very obviously don’t play computer games. To simulate the whole universe would likely take vastly more energy than is available in the universe and vastly more energy than is needed to have a real universe. The usual point of a simulation is to conduct quick and inexpensive experiments or comparisons. Simulations are also used for inexpensive training. If the simulation experiment or training gets too expensive, too energy intensive, then it is easier to do the real thing. We do simulations of aspects of the real world all the time, in our brains and in computers and in books, etc. but they are always very simplified. Also, they always break down eventually. They never perfectly match reality, even the very limited aspects of reality that any simulation attempts. In a simulation, the computer or brain has to calculate every single interaction and process. This is difficult and time consuming. So any simulation skips the details and focuses on a few critical aspects. In the real world, every atom, every molecule, every process does its own thing to extreme precision without need for calculations. In a simulation, each atom might need its own superduper computer to just get close to actual behavior. Then all those superduper computers have to talk to each other about their respective atoms individual behavior. Additional superduper computers would be needed to compute the interactions between each atom. It is much cheaper and easier to have real atoms having real interactions. People often discuss how dreams feel so real that we wonder is the dream real or the waking world a dream. There are big differences though and many people can tell when they are dreaming, at least some of the time. Dreams don’t follow the laws of physics, they jump around. Events in dreams don’t have normal momentum or inertia. The emotions in dreams feel very real, but they are our emotions. We may experience our impression of how someone else will react in our dreams, but we have to return to waking life to find out for sure how others will react. Simulations are great for limited purposes but they are not a substitute for reality. Actually the behavior and interactions from the very large (Einstein) to the very small (quantum) are represented by a couple of handfuls of relatively short equations. So the program just acts on the data set in a simulation. We also could assume that if it were a simulation it is simpler than the reality above it. You do not need a computer to manage every atom. In fact you do not need a lot of computing power as a whole. Just because we experience time as if it was being processed in parallel does not mean this is the case. The nature of “plank time” states that time exists in descrete quantities at 10^-40 seconds. In a simulation processing would take place between our moments of experience. The experiencing of the universe is just the output of the processing not the processing itself and does not have to be done in parallel. The program could “post” I the state of the universe from moment to moment. Projections do not program people. Studies show that you just turn off the TV or computer to relate to existing terrain. I am a Naturalist as the Earth still discovers it’s roots, day by day. Good article for all the novice machine based humanoids lost in a printed circuit world. the author does not understand simulation. if it is a simulation we are in you cannot necessarily observe it and draw conclusions about its nature. If god is programmed in … then god exists. If there is an inherent purpose to the existence of the universe it was programmed in. the author is projecting that somehow conclusions could be drawn about the environment outdside of the simulation by observing the simulation. He is imposing his rules on the programmer. You cannot assume this. No more than a spreadsheet program can interact with water at the beach could the simulation know anything outside of its environment. Descartes only in a way belongs in this discussion. There needs to be a stage, a game machine, for a simulation to be experienced, and consciousness seems to be a product of mechanical meat. A clever trick, Doctor. But none of you are real. Calling the universe, and us, products of a simulation does not provide a superior explanation for what we observe. The simulation hypothesis is unnecessarily complicated, and adds nothing to our explanations from physics. Simulation as an explanation can be definitively rejected on those grounds alone. If the evidence ever changes in its favor, the simulation hypothesis can be re-examined. Seeing that no one has yet any idea as to where all of this came from and what time or consciousness is, I think you can guess all you want. Attempting to shoot an argument down, when you have absolutely no evidence to the contrary is just as fruitless. Correct. (Time does not exist, however, and clocks big and small are merely measuring their own speed in imaginary units). Trying to explain consciousness is a big deal in some circles, but where everything came from we have even less to work with. Matter will probably be found one day not even to be made of “stuff”, but until then anyone who claims to know the origin of matter is deluded. Quantum mechanics is fun but a big part of the science involved is a human desire to know what’s on the other side of the mountain. Successful writers of stories and novels make a good living knowing this, as do the backers of the CERN supercollider who are counting on continued big-money interest. Fine with me! Hey simulated universe Matrix-imbued believers, what’s next? Slender Man or Big Foot? A sighting of Lady Luck. She’s a hot red-head. I’ve seen her. This is a stunningly poor article. I personally don’t buy the simulation argument, but the author’s reasons are completely nonsensical. Why assume the simulation is running at full speed with respect to the outside world? A simulation could run at any speed. Take a simulation of airflow over an airplane wing for example. We could run that on a supercomputer and maybe get somewhere close to real-world time. Or I could run it on an old pentium and it could take years. To the simulation itself it is exactly the same. What the hell are you talking about? Of COURSE neurons are interpreting signals, that’s exactly what they evolved to do! Neurons are fundamentally information processing machines, which take in information in the form of chemical signals, process them, and output information in the form of electrical signals. If it simulates in full the entire physical properties of the brain, we have an incredibly strong foundation to assert that it would be conscious. To do otherwise is to assert dualism, which is to basically give up on the whole endeavor of science, throw your hands in the air, and declare defeat. There is no basis whatsoever for making that claim. I came here hoping for a reasonable argument against the simulation hypothesis, and instead get anti-science dualistic inanity. What the hell is going on skeptic? I agree with Sven (34), awc (27), Florian Habermacher (17), and thank John A Johnson (3) for linking to a much more interesting article. Oh yeah! Now I remember why I stopped wasting my time reading Skeptic Magazine. Here’s one singl ed vpriblem eith computer simulation. I ask, why can’t I fly? Why can’t I run like The Flash? Why can’t I stave off bullets like Superman? Every person I know or have ever met can’t do any of these things. We can all differentiate, though, between our inability to fly and a comic book artist/writer, movie maker, and computer programmer’s ability to simulate flight, fast speed and invulnerability. This ability vannot be demonstrated by any known being we’ve ever encountered, nor demonstrated as possible by exusting laws of physics. Since it can’t be demonstrated that super qualities are possible in any known beings in any fashion where a ny have been observed in violation of the laws of physics, it must be assumed they cannot until shown otherwisem. Any discussion without one event demonstrating otherwise becomes avsurd and meaningless, as absurd, by definition, as the question, what happens when an unstoppable force hits an unmovable wall? It’s fascinating how much the holographic argument resembles the ontological argument for the existence of God. Essentially, since we can imagine a greatest possible being, it must exist. Now if I were actually to make such an argument, I’d be laughed out of the forum, but many of the people who’d reject it consider the holograph argument to be serious. I suspect it’s because if I make the argument for the existence of God, accepting it means accepting the existence of a being who imposes actual rules and things people don’t want to believe. Whereas the holographic argument is a license for pure solipsism in a self-created universe where you never have to believe anything you don’t want to. This position, and most positions rebutting The Simulation Hypothesis, have a key error in judgement whilst arguing for the nature of the Self– these views are coming from a barely-attained Type I Civilization (Kardashev Scale), while a simulated universe would likely come from a Type III or greater group. To watch how the last 3-4 decades of the Technology Age have affected and directed our civilization it’s abundantly clear as you’ve pointed out, this is new water for our species. This makes it very difficult to envision the World of Tomorrow, and the possibilities or requirements it may present to us. I would posit that a simulation doesn’t necessarily imply any further purpose for a host species than information production. The idea that a species would be capable of such an act could be similar to the reasons we, as humans, run simulated data environments. It doesn’t necessarily require the host-species to manipulate the experiment. Oftentimes it’s enough to set the initial parameters, and wait to see what happens. None of this, however, precludes the notion of purpose in our own lives. Nothing in this states we can’t be self-driven. For a host species using it to gather information (my own theory would be to assume some sort of Prediction Engine), any data is good data. – Just as we have no proclivity to assert that it wouldn’t, either. You are simply laying out one side of an argument that hasn’t been proven either way. I could definitely bring in the evolving nature of machine learning, and human-inspired behaviors that are constantly being developed for and by machines (did you know Google Translate actually came up with its own machine language to assist in translation…to the surprise of its own engineers?). We have no foundation to assert that acts such as these won’t eventually produce a “Ghost in the Machine” much akin to what we call consciousness. I don’t believe I am a simulation either. But if I did, this article would not convince me otherwise. I am an AGI researcher. I previously published a piece on my blog that makes the same points here, I’m glad that my analysis is now reproduced by independent thinkers. I’m going to publish a revised version that improves the central refutation here, one of these days, on the arxiv. I don’t think this actually proves anything, even rhetorically. You’re relying just as much on assumptions as people who argue for the possibility of a simulated reality. And your argument really breaks down in some places…for example, the brain absolutely does process information even if its individual neurons do not. When you do math, for example, your brain process information. It may use different mechanisms than a silicon based processor to arrive at the conclusion that two plus two equals four, but it processes information regardless. I must say, this is brilliant. I never seen so much disillusion and stupidity in one post before. Can you do the other simulations a favor? I don’t accept the simulation hypothesis, but to claim that somehow no program running in a computer could ever have “real” emotions is just irrational, it’s a claim that there is something magical and special about the human brain which we have no evidence for. Neurons are fundamentally a form of circuitry which transmits electrical signals in a way that processes information. Just because the brain is like no computer we currently have today, that’s not evidence doesn’t mean that consciousness or emotions are magical or impossible to simulate. Excellent critique from a knowledgeable source. Why do so many people, neo darwinian epicurean materialists for the most part, have such high regard for computers or the latest tech, and such low regard for the human lives that it is all reverse engineered from? I believe that the issues of God intelligently designing nature in the first place, is near the heart of the issue. This discussion is orbiting that issue as if it were a sun, and is bound to spiral in toward the identity of man and Jesus. The struggle over consciousness and reality perception is a grappling with issues of identity, individuality, morality, responsibility, property rights, authority, and ultimate universal worth. This is why after robots and detailed virtual world’s are common, they will almost immediately be passe. It’s not about the ai or the robot or even automation. It’s about our own living identity and respectful place. Surprised no one made the basic point that it’s just added complexity.